Monday: Kasen played tug on a rope, well, more like hold a rope. Then Kasen’s teachers sang “15 Miles on the Erie Canal” with the babies. Kasen enjoyed playing in the pit with his friends. 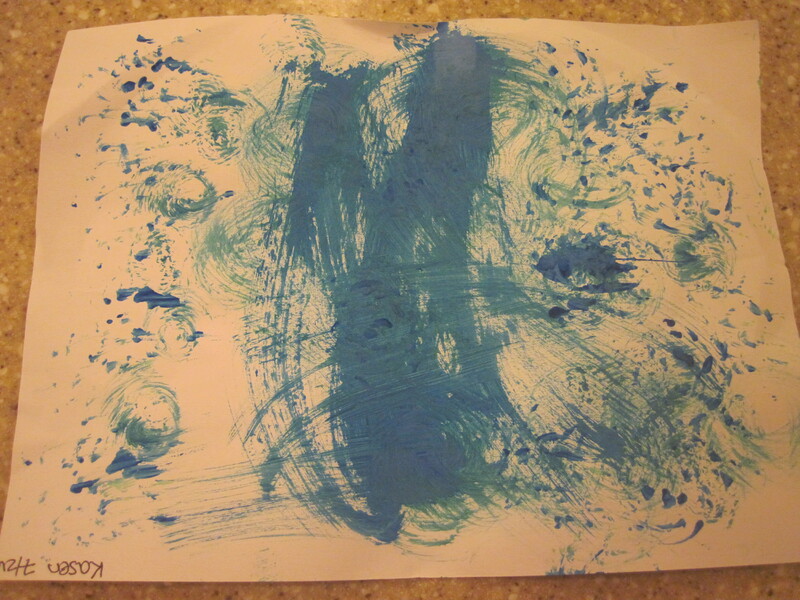 Tuesday: Kasen painted a picture of the Panama Canal (pictured below) with a sponge. He also pretended to sail down the Suez Canal by sitting in a box and singing Row, Row, Row Your Boat. Kasen’s teachers blew bubbles for the babies to play with. Kasen really enjoyed playing on the playground. He found a big purple ball to roll to his friends. Wednesday: Kasen enjoyed playing with a bucket during water play. He dipped it in the water and then splashed his hands in the bucket. Kasen and his classmates drew fish with chalk on the sidewalk. They also played with shakers to make music. 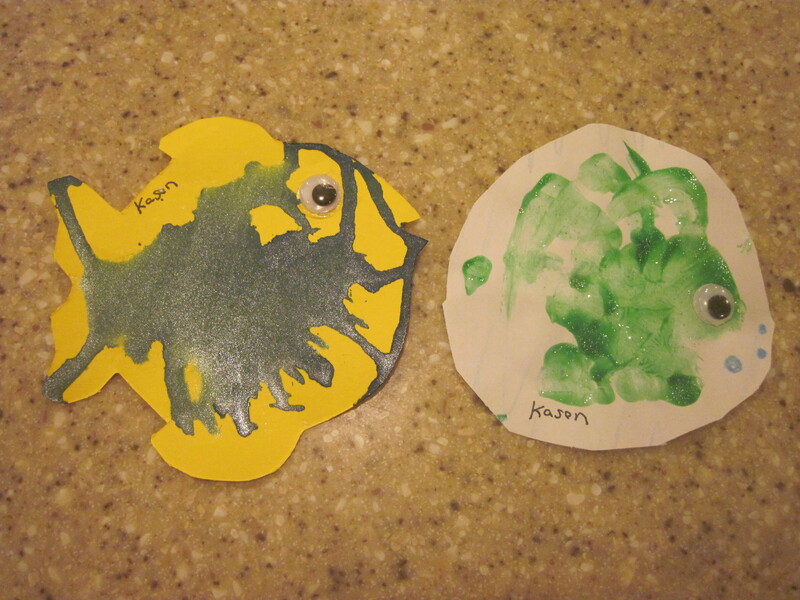 Thursday: Kasen and his classmates created an underwater collage, using tissue paper, paint, glue and sticker fish. All the babies pretended to be octopuses (flailing their limbs around). Kasen enjoyed playing with a rain stick and looking at himself in the mirror. Monday: Kasen’s teachers played traditional Indian music in class and helped the babies dance with jingle bells. Kasen and his classmates tried to build the Taj Mahal using colored blocks. 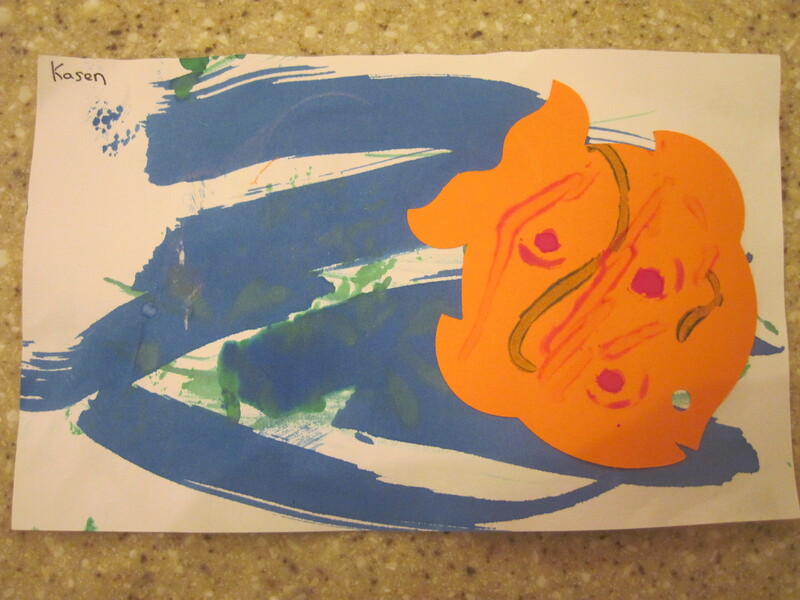 Kasen’s teachers report that Kasen really enjoyed knocking down the Taj Mahal. Hopefully not the real one. Tuesday: Kasen and his classmates fingerpainted with gold glitter on white paper to make genie lamps. Kasen had fun playing in in the sand on the playground, even though he got sand in his face. Wednesday: Kasen glued together an Indian flag. He also played in the water. His teachers said that Kasen tried to climb into the tub of water! He does love swimming. Thursday: Kasen enjoyed “running his fingers through” (we think this means “trying to eat”) colored rice. He held the cup filled with rice and dumped it out. Kasen’s class played with shoes today; the class decorated shoes and looked at pictures of shoes in magazines.